For those that do not know the 101 Dalmatians was actually a children's book before it became an animated movie. Cruella De Vil is one of the most vile characters to exist in children's books and Disney films (my opinion). I love her, shes freaking frightening and the wicked creation of Dodie Smith (the writer of the original story). The woman still scares me as an adult watching the movie and as a kid I couldn't watch her she gave me nightmares. Haha! 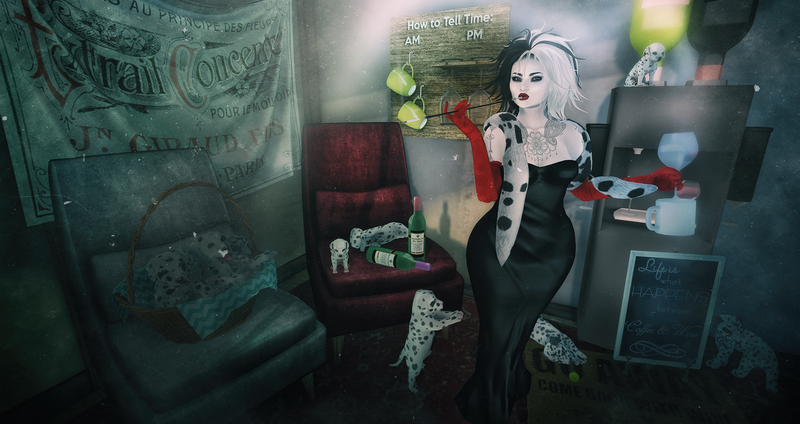 Well here is a tribute to her character featuring the cute new dalmatians by Black Bantam at N21 and the previous Arcade dalmatians by Mutresse. The out fit is a gacha set by Viki. The gloves are not bento. They are mesh and come with a HUD to animate them. Pretty neat! I hope you enjoy this post!